General view Landi Kotal Pass, showing windings & descent. bl.uk > Online Gallery Home	> Online exhibitions	> Asia, Pacific and Africa Collections	> General view Landi Kotal Pass, showing windings & descent. 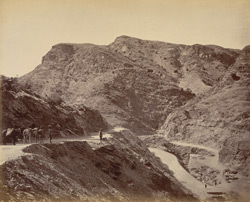 Photograph with another view of the winding road built through the Landi Kotal Pass by the Queen's Own Madras Sappers and Miners, taken by John Burke in 1878. Burke accompanied the Peshawar Valley Field Force, one of three British Anglo-Indian army columns deployed in the Second Afghan War (1878-80), despite being rejected for the role of official photographer. He financed his trip by advance sales of his photographs 'illustrating the advance from Attock to Jellalabad'. Coming to India as apothecary with the Royal Engineers, Burke turned professional photographer, assisting William Baker. Travelling widely in India, they were the main rivals to the better-known Bourne and Shepherd. Burke's two-year Afghan expedition produced an important visual document of the region where strategies of the Great Game were played out. Military engineering in India was the responsibility of the Royal Engineers, the Indian Sappers and Miners and the Indian Pioneer Regiments. Their role was to assist the movement of the Army and impede that of enemy forces. Working mostly in rugged terrain, their duties included road and bridge construction, water supply, construction of fortifications, camp construction, and the demolition of enemy defensive works, as well as other general engineering works. They marched and fought side by side with the infantry, cavalry and artillery. The Queen's Own Madras Sappers and Miners was one of three Corps of sappers drawn from each of the British Presidencies in India, and was originally raised in 1780.